Okay, at the end there’s some Chipcore too. Hey, thanks a lot for mentioning us on your show. We talked a bit about you on Episode 20 of the Gamewave Podcast. this month was great as well as past. I love episodes which contains vivid collection from all kind of styles and I feel this month had more such kind of vividness..
perhaps because of chiptune stuffs at the end? Anyway, much appreciation for your efforts from berlin, looking forward of the next! Sind mal wieder ein paar nette Stücke dabei. Am besten gefällt mir der Introsong. Wieder ein großes Lob von meiner Seite. Weiter so. Great Show! 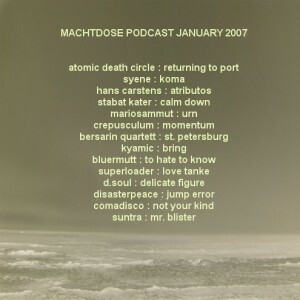 I’m glad to have found your podcast, I love your music selection … Also glad that you chose to feature Jump Error on this month’s show, I am honored. I will most certainly be tuning in from now on. thanks for include one of my tracks of Aura e.p…. hey all! thanks for releasing Urn on January podcast! you do great work over here! cool music cool everything! keep up the gud stuff :).